Acknowledged author Catherine E. Burns PhD RN CPNP-PC FAAN wrote Pediatric Primary Care, 6e comprising 1296 pages back in 2016. Textbook and etextbook are published under ISBN 032324338X and 9780323243384. Since then Pediatric Primary Care, 6e textbook received total rating of 4 stars and was available to sell back to BooksRun online for the top buyback price of $54.10 or rent at the marketplace. Get an in-depth look at pediatric primary care through the eyes of a Nurse Practitioner! 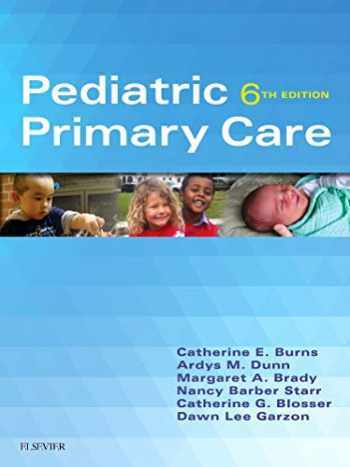 Pediatric Primary Care, 6th Edition guides readers through the process of assessing, managing, and preventing health problems in infants, children, and adolescents. Key topics include developmental theory, issues of daily living, the health status of children today, and diversity and cultural considerations. This sixth edition also features a wealth of new content and updates ― such as a new chapter on pediatric pharmacology, full-color design and illustrations, new QSEN integration, updated coverage of the impact of the Affordable Care Act, a refocused chapter on practice management, and more ― to keep readers up to date on the latest issues affecting practice today.Comprehensive content provides a complete foundation in the primary care of children from the unique perspective of the Nurse Practitioner and covers the full spectrum of health conditions seen in the primary care of children, emphasizing both prevention and management. In-depth guidance on assessing and managing pediatric health problems covers patients from infancy through adolescence.Four-part organization includes 1) an introductory unit on the foundations of global pediatric health, child and family health assessment, and cultural perspectives for pediatric primary care; 2) a unit on managing child development; 3) a unit on health promotion and management; and 4) a unit on disease management. Content devoted to issues of daily living covers issues that are a part of every child's growth ― such as nutrition and toilet training ― that could lead to health problems unless appropriate education and guidance are given. Algorithms are used throughout the book to provide a concise overview of the evaluation and management of common disorders. Resources for providers and families are also included throughout the text for further information.Expert editor team well is well-versed in the scope of practice and knowledge base of Pediatric Nurse Practitioners (PNPs) and Family Nurse Practitioners (FNPs).NEW! Updated content throughout reflects the latest developments in our understanding of disease processes, disease management in children, and current trends in pediatric healthcare.NEW! Chapter on prescribing pediatric medications emphasizes the unique needs of children in pharmacotherapy.NEW! Practice Alerts highlight situations that may require urgent action, consultation, or referral for additional treatment outside the primary care setting.NEW! Full-color design and illustrations improve usability and learning. NEW! Graduate-level QSEN integration: Quality and Safety Education for Nurses (QSEN) is now introduced in the Preface.The QSEN Safety competency is now emphasized via the new Practice Alert highlights and integration of National Patient Safety Goals and Core Measures.The Informatics competency is addressed with new informatics content in a refocused Strategies for Managing a Pediatric Health Care Practice chapter.The Teamwork and Collaboration competency is addressed by new content on the trending topic of interprofessional collaboration, also in the Strategies for Managing a Pediatric Health Care Practice chapter.The Evidence-Based Practice competency is integrated through icons that reference evidence-based guidelines.Reorganized application of Gordon's Functional Health Patterns provides a more conceptually consistent flow with Gordon's model.Expanded integration of Healthy People 2020 goes beyond the emphasis on physical activity in the previous edition.Expanded coverage of health literacy includes application of health literacy principles ― the ability to obtain, read, understand, and use healthcare information to make appropriate health decisions and follow instructions for treatment ― in relevant chapters.Additional coverage of growth and development includes a thorough revision of the chapter on developmental management in pediatric primary care along with inclusion of developmental milestones in appropriate chapters. Expanded coverage of assessment, genetics and epigenetics, mental health issues, the Children with Special Health Care Needs (CSHCN) Services Program, and global health reflect the growing impact of these trends on pediatric primary care.Updated coverage of the Affordable Care Act includes a focus on the impact of the Affordable Care Act (including Medicaid expansion) and its implications for access to pediatric healthcare.Updated coverage of the Bright Futures guidelines goes beyond the previous edition’s focus on mental health and sexual development. NEW! Focus on diversity (vs culture) offers a greater emphasis on diversity in its many dimensions rather than on culture alone.Refocused practice management chapter has been retitled Strategies for Managing a Pediatric Health Care Practice and eliminates general practice management content that is already covered in other parts of the curriculum to focus on content more specific to pediatric practice management ― including the various settings for pediatric primary care, informatics, and other essential topics influenced by the Affordable Care Act, National Patient Safety Goals, and the growing trend of interprofessional collaboration.